Im certainly not envious of the younger generation of Astro-Scientists .... watching the EM wonders of nature unfold before them but bound to the Gravity-centric doctrine ... conflict much? Mainstream defenders have historically attacked the EU position that celestial objects are charged bodies moving in a plasma environment. This article is a giant step by mainstream toward acknowledgement of that position, though they will no doubt say "we knew that along." Makes me wonder if we were actually looking for these things instead of accidentally wandering into them and being baffled we could learn so much more. Hopefully the future will hold more and more clues to the physics of our space environment. Amazing that they have the data now, -200 V of charge across 2,000 km if I understand that correctly. A spacecraft exploring the Saturn system was zapped by static electricity sent out by one of the ringed wonder's many moons in 2005, a new study suggests. In fact, scientists have found that the Cassini spacecraft was "briefly bathed in a beam of electrons" coming from the moon Hyperion's surface, NASA officials said. "It was rather like Cassini receiving a 200-volt electric shock from Hyperion, even though they were over 2,000 kilometers [1,200 miles] apart at the time," Tom Nordheim, a doctoral candidate at Mullard Space Science Laboratory (MSSL), University College London, said of the new finding in a statement. This occurred in 2005! They've been sitting on this for nine years! That they even said "the moon's surface may acquire a net electric charge" is jaw-dropping. It will either end up as a footnote (as it "only" affected a spacecraft) or will create a domino effect to rethinking Io and Enceladus and their activity particularly. That they concede to Hyperion being negatively charged alludes to comets even if they probably don't connect those dots yet. I can't wait until they attempt to land on 67P. I don't actually expect a discharge between Philae and 67P, since the lander's approach has been slow so far, and I expect there has been enough time for charge equalization already. High-speed approaches between differing charge potentials seems to trigger discharge. I fully expect something extraordinary today or tomorrow between Siding Spring and Mars. Philae, if I were a betting man, will not experience a lightning bolt, but simply smash into a brick wall. 67P is solid rock and no part of the lander was designed for a hard surface. The only saving grace may be that the comet's gravitational field is so relatively tiny it won't contribute much to the lander's death. I'm stunned the press release about a 200 volt electrical exchange comes NINE YEARS after the event occurred. Nuts, was so excited to share! Let's keep the other thread, as it has momentum already. Cheers. viscount aero wrote: That they concede to Hyperion being negatively charged alludes to comets even if they probably don't connect those dots yet. I can't wait until they attempt to land on 67P. 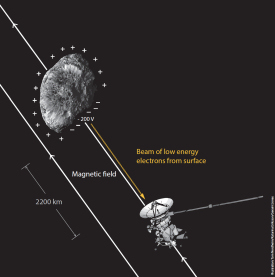 The first confirmed detection of surface charging on an object in the outer Solar System has wide-ranging implications. This fundamental process is predicted to occur on many different bodies, including asteroids, moons and the surface of comets. Scientists have previously suggested that surface features observed on the asteroid Eros and several Saturnian moons are due to the motion of charged dust across their surfaces. On small objects with low gravity, dust grains might even be able to overcome the force of gravity and escape into space. In terms of human exploration of planetary objects without atmospheres, such as the Moon, strong electric charging effects may also prove to be a hazard to astronauts, who might be subjected to strong electrostatic discharges. The sad thing is that charged dust being influenced by electric and magnetic fields, is more generaly or perhaps properly called dusty plasma. And how all of a sudden this is of danger for astronauts is a mystery to me, as with the Apollo missions it seems they were entirely save the dust didn't even had the tendensy to cling to the landers or the astronauts suits, and they were happy enough to go in and out of the landers without endangering the electrical equipment inside. Right? And judging from this pic in the article it seems the electrons were following the magnetic field lines? Does this observation have impact on the understanding of the debye lenght in space plasma? By the way here is a link to the pdf of the more in depth article. Yes. I should have clarified a bit more. They haven't connected the dots with comets insofar as how they probably work. They've already admitted to the Moon's water ice having probably been created by the solar wind, going even as far to explain the process of the creation of hydroxyls (OH-)--exactly as explained in the Thunderbolts documentary about the electric comet. And even with the news about Hyperion (which is actually 7 year-old data) they fail to make the leap to comets. But perhaps in time they will. I think when they try to land the probe onto comet 67P something is going to flip them out Something is going to happen that will "baffle" them. I agree Many science press releases and their reasoning is a mystery to me. viscount aero wrote: Yes. I should have clarified a bit more. They haven't connected the dots with comets insofar as how they probably work. They've already admitted to the Moon's water ice having probably been created by the solar wind, going even as far to explain the process of the creation of hydroxyls (OH-)--exactly as explained in the Thunderbolts documentary about the electric comet. And even with the news about Hyperion (which is actually 7 year-old data) they fail to make the leap to comets. But perhaps in time they will. I think when they try to land the probe onto comet 67P something is going to flip them out Something is going to happen that will "baffle" them. In that sense, I agree, and as can be seen in the Mercury-thread, with the latest posts by Frantic and Seasmith, it seems that even with water there, they are still stuck on some sort of seeding of water way way into the past. They even make allusions to subsurface ices for old deposits and late impact depositions to try to explain the seemingly recent depositions. Let alone the ubiquitous impact gardening. But actually that whole article is all over the place. Typical. may have been delivered to the inner Solar System throughout its history. Now what could that ongoing process actually be...? Typical of press releases are the obtuse but nonsensical language used to mask the lack of actual knowledge of what phenomena is occurring. They use the terms "impact gardening" and "space weathering" very vaguely and non-explanatory. That they are hung up on the meme of: "...a considerable mass of volatiles may have been delivered to the inner Solar System throughout its history" is very telling in that they cannot get past thinking that the water, any and all water, had to be "carried to the planets" from somewhere. Why must all of the water be somewhere else--far off in a fantasy land like the Oort Cloud--when it is in giant abundance on several celestial bodies? Scientists discovered by studying data from Cassini, that Saturn's moon Hyperion hit the spacecraft with a field aligned -200 volt electron particle beam, from a distance of about 1,200 miles. It was so brief that luckily nothing was damaged. The positive charged spacecraft became grounded with the moon, and zap electric current traveled through space. From this they say Hyperion has a -200 negative surface potential. Earth's moon is -20 volts and increases on the dark side and especially in the magnetosphere over -200 volts. Only an idiot that can't comprehend what I'm saying could believe that gravity is ruling our solar system.